A third power polynomial, also called a cubic polynomial, includes at least one monomial or term that is cubed, or raised to the third power. An example of a third power polynomial is 4x3-18x2-10x. To learn how to factor these polynomials, begin by getting comfortable with three different factoring scenarios: sum of two cubes, difference of two cubes and trinomials. Then move on to more complicated equations, such as polynomials with four or more terms. Factoring a polynomial requires breaking down the equation into pieces (factors) that when multiplied will yield back the original equation. Use the standard formula a3+b3=(a+b)(a2-ab+b2) when factoring an equation with one cubed term added to another cubed term, such as x3+8. Determine what represents a in the equation. In the example x3+8, x represents a, since x is the cube root of x3. Determine what represents b in the equation. In the example, x3+8, b3 is represented by 8; thus, b is represented by 2, since 2 is the cube root of 8. Factor the polynomial by filling in the values of a and b into the solution (a+b)(a2-ab+b2). If a=x and b=2, then the solution is (x+2)(x2-2x+4). Solve a more complicated equation using the same methodology. For example, solve 64y3+27. Determine that 4y represents a and 3 represents b. The solution is (4y+3)(16y2-12y+9). 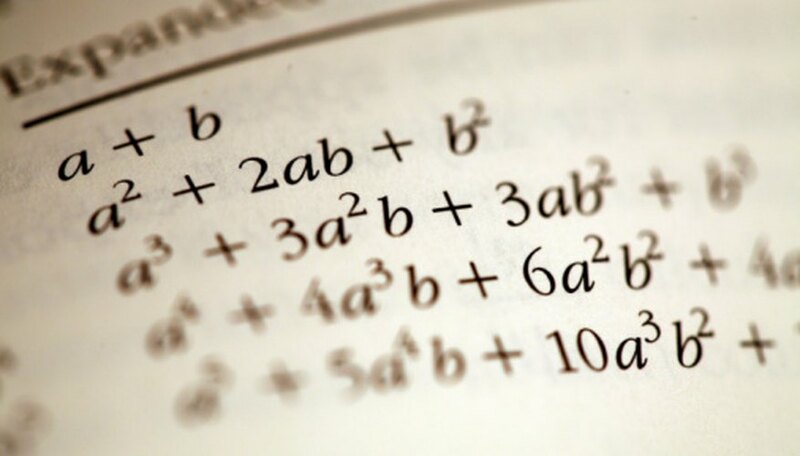 Use the standard formula a3-b3=(a-b)(a2+ab+b2) when factoring an equation with one cubed term subtracting another cubed term, such as 125x3-1. Determine what represents a in the polynomial. In 125x3-1, 5x represents a, since 5x is the cube root of 125x3. Determine what represents b in the polynomial. In 125x3-1, 1 is the cube root of 1, thus b=1. Fill in the a and b values into the factoring solution (a-b)(a2+ab+b2). If a=5x and b=1, the solution becomes (5x-1)(25x2+5x+1). Factor a third power trinomial (a polynomial with three terms) such as x3+5x2+6x. Think of a monomial that is a factor of each of the terms in the equation. In x3+5x2+6x, x is a common factor for each of the terms. Place the common factor outside of a pair of brackets. Divide each term of the original equation by x and place the solution inside the brackets: x(x2+5x+6). Mathematically, x3 divided by x equals x2, 5x2 divided by x equals 5x and 6x divided by x equals 6. Factor the polynomial inside the brackets. In the example problem, the polynomial is (x2+5x+6). Think of all the factors of 6, the last term of the polynomial. The factors of 6 equal 2x3 and 1x6. Note the center term of the polynomial inside the brackets -- 5x in this case. Select the factors of 6 that add up to 5, the coefficient of the central term. 2 and 3 add up to 5. Check the factoring solution by multiplying the factors. If the multiplication yields the original polynomial, the equation was factored correctly. Brunet, Michelle. "How to Factor Third Power Polynomials." Sciencing, https://sciencing.com/factor-third-power-polynomials-7448769.html. 15 May 2018.